A Tn5-based transposon bearing the kil gene (killing protein), mediating controlled export of periplasmic proteins into the culture medium, was constructed (Tn5-KIL3). This transposon contained the kil gene of the ColE1 plasmid under the growth-phase-dependent promoter of the fic gene (filamentation induced by cAMP) of Escherichia coli, an interposon located upstream of kil, a kanamycin/neomycin-resistance gene, a multiple cloning site and the mob site. 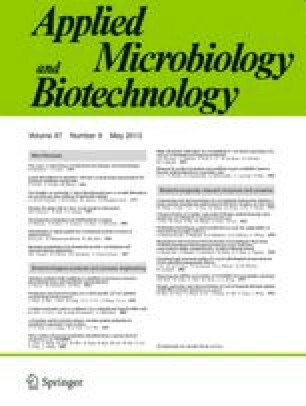 The transposition of Tn5-KIL3 to Acetobacter methanolicus showed a moderate transposition frequency (10−5–10−6). By insertion of a Bacillus hybrid β-glucanase (bgl ) as a model protein into the transposon (Tn5-LF3) it was shown that the secretion function as well as the gene of the target protein had been transferred to and stably integrated into the chromosome of A. methanolicus, and that the transposition of Tn5-LF3 was non-specific. β-Glucanase was highly overexpressed and secreted into the medium during stationary phase. Total and extracellular production of β-glucanase varied depending on the integration site of the transposon. The viability of the bacterial cells was not affected, and cell lysis did not occur.